Testimony • As a boy, he was "always teasing and causing turmoil." Al Hartmann | The Salt Lake Tribune Brian David Mitchell enters the Frank Moss Federal Building escorted by federal marshall in Salt Lake City on Wednesday November 17th. Al Hartmann | The Salt Lake Tribune Brian David Mitchell climbs out of federal marshall car outside the Frank Moss Federal Building in Salt Lake City on Wednesday November 17th. Al Hartmann | The Salt Lake Tribune Brian David Mitchell climbs out of federal marshall car outside the Frank Moss Federal Building in Salt Lake City on Wednesday. 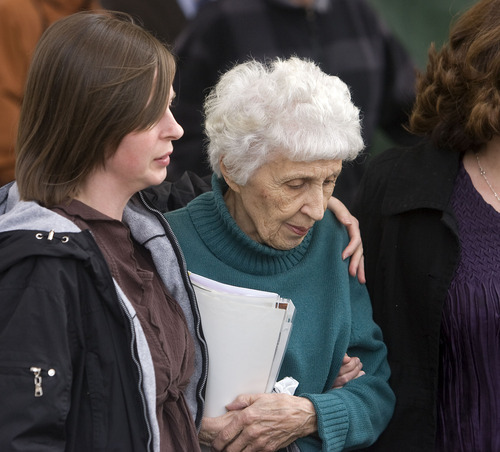 Al Hartmann | The Salt Lake Tribune Irene Mitchell, mother of Brian David Mitchell is shielded from the media by family members as she leaves the Frank Moss Federal Building in Salt Lake City on Wednesday, Nov. 17. She testified for the defense. 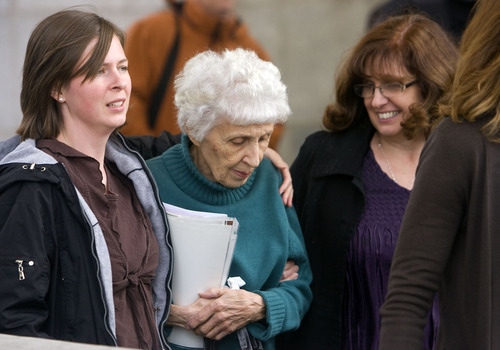 Al Hartmann | The Salt Lake Tribune Irene Mitchell, mother of Brian David Mitchell, is shielded from the media by family members as she leaves the Frank Moss Federal Building in Salt Lake City on Wednesday, Nov. 17. She testified for the defense. 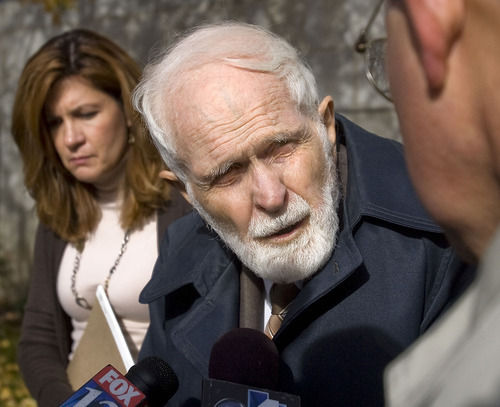 Al Hartmann | The Salt Lake Tribune Shirl Mitchell, 87, father of Brian David Mitchell speaks to the media as he leaves the Frank Moss Federal Building in Salt Lake City on Wednesday November 17th. He testified for the defense. Al Hartmann | The Salt Lake Tribune Homeless advocate Pamela Atkinson leaves leaves the Frank Moss Federal Building in Salt Lake City on Wednesday November 17th after testifying in the Brian David Mitchell trial. She had no comment to the media. 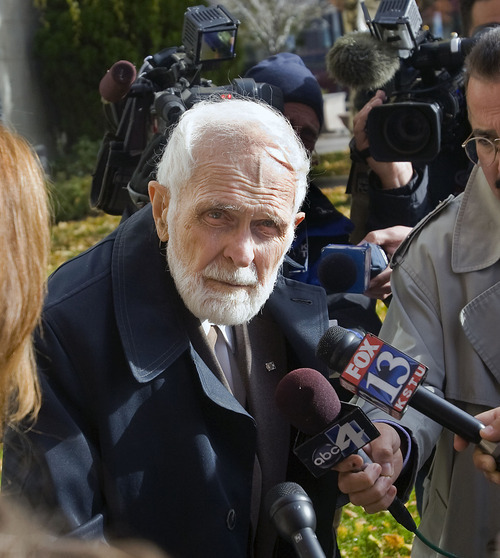 Al Hartmann | The Salt Lake Tribune Shirl Mitchell, 87, father of Brian David Mitchell speaks to the media as he leaves the Frank Moss Federal Building in Salt Lake City on Wednesday November 17th. He testified for the defense. Brian David Mitchell's present-day problems may have begun while he was still in his mother's womb, the alleged kidnapper's elderly father told a federal-court jury on Wednesday. Shirl Mitchell testified that he was deer hunting when his son was born, and his wife harbored resentment that was subliminally transferred to the child. "There are a whole series of alienation incidents, from the time he was probably in the womb," the 87-year-old testified on behalf of the defense. Shirl Mitchell also admitted, "I didn't have too much connection [with Brian Mitchell], and maybe that's the trouble. He sort of isolated himself in his own little world, you know. He wasn't very responsive to me or my instruction or correction." Mitchell said that by the age of about 10, the "rebellious" boy was "always teasing and causing turmoil in the family." He hated to be chastised  to the extent that he would jump from the car at a stoplight and run away, his father said. "There was one morning, I lost my patience," the elder Mitchell testified. "I hauled him off to Rose Park and left him." But young Brian made the best of it. Some Japanese tourists paid the boy to take their picture at the state Capitol, and he spent the money on a double-feature movie, returning to his east-bench home after dark. "That was typical of Brian," Shirl Mitchell said. "He was smart." The father's admiration doesn't extend to his son's 27-page religious manifesto titled, The Book of Immanuel David Isaiah, in which he claims God has chosen him to be his voice and also advocates polygamy. "I read that little essay he wrote," Shirl Mitchell said. "But I didn't comment on it. I didn't discuss it with him." He said his son was always "poring over Mormon scriptures" and became a "zealot and rabid about" the LDS Church, which "led to these delusions that he was Immanuel." But by penning the book, the younger Mitchell may have been trying to emulate his father, who said he has spent a good part of his life on a constantly changing tome titled, Spokesman for the Infant God or Goddess. "I propose a supermagnetic being that can take a memory impression of individuals ... that can remember all of us," Shirl Mitchell said, trying to explain his book to defense attorney Robert Steele. "What are your two best ideas in your book?" Steele asked. "The primary idea is a very pragmatic idea that deals with nutrition. The second, the major of theme, is on reproduction," Mitchell testified. "Our continuity depends on the race's reproduction. Those two things are at the root of everything." Expanding on the nutrition theme, Mitchell said that certain foods produce mucus, which clog the body's filtering processes. He said proper nutrition depends on eating fruits and vegetables  a notion that his son also adopted, along with "lymphology," which advocates bouncing up and down to cleanse the cells. Shirl Mitchell said that his own father  who was obsessively litigious  spent time at Utah State Hospital for treatment of a mental illness. Mitchell, a former employee of the social-services department, said of his son outside the courthouse: "I'm hopeful he'll go to a rehabilitative situation where it will be recognized he's not normal, he's not sound." Brian Mitchell is charged with kidnapping then-14-year-old Elizabeth Smart from her Federal Heights home in June 2002. He allegedly sexually assaulted her almost daily during the next nine months. The defense hopes to convince the U.S. District Court jury that Mitchell is not guilty because he was insane at the time the crimes were committed. But prosecutors managed to elicit answers from most defense witnesses that indicated the opposite. Also testifying Wednesday were Mitchell's mother and two sisters. A brother is scheduled to testify Thursday, along with Mitchell's third wife and co-defendant, Wanda Eileen Barzee, who has pleaded guilty and is serving 15 years in prison for her role. Irene Mitchell told the jury that testifying about her son was "just painful. I remember my son as a little boy. Now he is not the same person." The former high school English teacher and mother of six  who is now divorced from Shirl Mitchell  admitted she was losing her memory, but she recalled Brian Mitchell getting into trouble by staying up all night reading and skipping school. She said her son moved in with his grandmother and began attending East High, but he failed to graduate. She also recalled that Brian Mitchell had called 911 because he had taken LSD "and it was frightening to him." She testified about an incident in 1970 when Mitchell was referred to juvenile court for allegedly exposing himself to an 8-year-old girl. 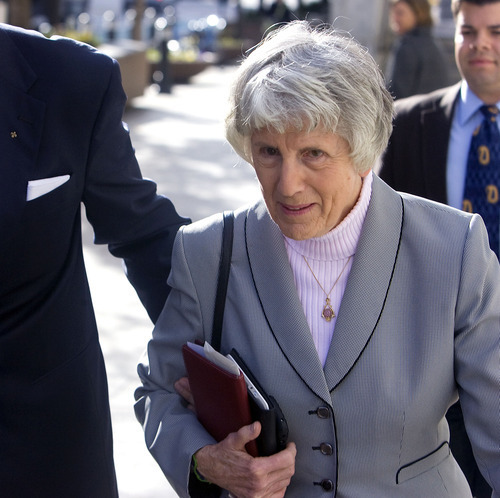 Irene Mitchell said a psychiatrist told her "that when a child has parents pulling him in two different directions, he tends to get into power and manipulation. And he felt that was what happened with Brian, and I agreed with him." Testimony from Irene Mitchell and two of her daughters established that she and her husband had different ideas about child discipline and that they often argued. Prosecutor Diana Hagen asked Irene Mitchell about letters her son wrote while he was hiding out in New Hampshire with his two children in the late 1970s to avoid a child-custody ruling in Utah. Mitchell asks his mother not to reveal his address and mentions that although he is "more handsome" without long hair and a beard, they are part of "a new act." The boy and a girl from Mitchell's first marriage were the subject of much of Wednesday's testimony. Mitchell fled the state to keep his ex-wife from gaining custody, but he later gave up both children for adoption, apparently in an effort to improve his second marriage  which later ended in divorce. Mitchell's older sister, Kayleen Hill, a marriage and family therapist, testified: "I didn't think Brian was thinking rationally," and she wrote to authorities saying she didn't think he was "fit" to give up his parental rights. A younger sister, Lisa Holbrook, remembered her brother teaching her to ride a bike. "He was mischievous and liked to tease, but he was not malicious," Holbrook testified. But she also said her brother was "the squeaky wheel [that] gets the grease." "He drew a lot of attention, a lot of drama," she said, by "acting out and being noncompliant and breaking the rules and causing trouble." Holbrook said she called police to report that her brother matched the description of the "handyman" identified by Smart's younger sister as the kidnapper  a call that didn't result in immediate action. Marlon Peterson, a friend of Mitchell's from the mid-1970s, said they hiked, fished, skied and barbecued together. "He was full of energy  he loved learning and wanted to have experiences and try everything," Peterson said. "He was fun to be with." Peterson said he helped Mitchell flee the state with his two children by giving him some cash. He also drove them to a Provo bus station  instead of the closer Salt Lake City station  because Mitchell was afraid he was being watched by his second wife's friends. Peterson later learned that while Mitchell was living in New Hampshire, he joined the Hare Krishna for "survival, food, shelter and work," but later had "a hard time getting away from them." When asked about his reaction to Mitchell's arrest, Peterson sobbed briefly and said, "I didn't believe it. I didn't believe it was my Brian." U.S. District Judge Dale Kimball denied a motion Wednesday to acquit Brian David Mitchell of the charge of transporting a minor across state lines for the purpose of engaging in sexual activity. Mitchell's defense team had argued that the alleged sexual activity with Elizabeth Smart was incidental to the primary purpose of the trip from Utah to California in October 2002. But Kimball said in a written ruling there is evidence Mitchell was concerned that Smart would be discovered in Utah and believed it was urgent to travel to California after an encounter with a police officer at a Salt Lake City public library. "It is reasonable to infer that he wanted to avoid detection so the abuse would continue," Kimball wrote. In addition, he noted that Smart has testified "that he intended her to engage in what he defined as her wifely duties when they reached California."